Celebrate 40 years of excellence with one of the most beloved and storied franchises in hockey history. 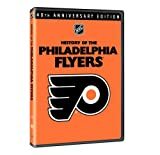 For the first time, you can relive the unforgettable moments, classic teams and legendary players of the Philadelphia Flyers, together on one definitive DVD. From the inception in 1967 to the Stanley Cup years of the Street Bullies, the infamous Legion of Doom and the current crop of superstars, this thrilling collection has it all. See the Flyers take down the Soviet champion Central Red Army team in 1976, witness Philadelphia smash the record book with a 35-game unbeaten streak in 1980, and watch the 2000 team survive a Five-period-overtime playoff marathon. Commemorate Philly's 40th anniversary with a collection every Flyers fan will want to watch again and again.